Donate – Nevada Humane Society | With Shelters located in Reno, and Carson City, the Nevada Humane Society Caring is a charitable, non-profit organization that accepts all pets, finds them homes, saves their lives, and is recognized as a leader in animal sheltering and stewardship. Note: Please make all checks payable to Nevada Humane Society. You may earmark any donation to a specific program or fund. For in memory donations, please include the name of the person or pet that passed and any family member that we may send an acknowledgement to so that they know a donation has been made in their honor. Thank you! Our standard adoption fee is $50 while our average cost to care for an animal at our shelter is $240 which includes spay/neuter surgery, microchipping, vaccinations, any other needed veterinary treatment, and daily care until adoption. In order to save lives and meet the needs of potential adopters, we frequently run promotions that discount our adoption fees. The lower fees are necessary to ensure that our homeless animals find loving, new homes, but obviously don’t begin to cover our costs. NHS is a charitable, 501(c)3, non-profit organization and the Federal Tax ID is 88-0072720. Our lifesaving success is dependent about individual, business, and foundation donations. Thanks for your support on behalf of the animals! A matching gift from your company is an easy way to double your charitable contribution to NHS. Many local and national companies and corporate foundations will match their employees’ gifts to nonprofit organizations. Check to see whether your company will match your charitable donation to us! or encourage your company to add to this fun benefit and join other companies supporting non-profits in your community. Request your company’s matching gift form. Complete the matching gift form and send it along with your donation to NHS. You can also make your donation online and send your completed form along with a copy of your online donation receipt to NHS. The Nevada Humane Society is pleased to offer our corporate partners excellent opportunities for visibility and participation. Companies can contribute to the NHS general operations fund, support a specific program, or host a fundraising event. The thousands of homeless pets NHS care for each year are counting on your help! Spreading the word about Nevada Humane Society’s good work can be as easy as a mention in your corporate publications. Your business can also support us by keeping employees informed about events and activities at the shelter through employee newsletters, your corporate website, or email communications. When your company partners with Nevada Humane Society, it is a win-win situation! That’s because being a good corporate citizen is also a good business decision. Shop at Smith’s and give back to Nevada Humane Society! It’s easy. Enroll online for a Smith’s Community Rewards®, start shopping, and choose Nevada Humane Society as your beneficiary. There is no cost to enroll and it will not affect your fuel points or coupon discounts. Host a fundraising event! From bake sales to yard sales to a car wash or dog walking service, you can raise funds for Nevada Humane Society by keeping it simple. Check out our Third Party Fundraising Kit for details, including how to get a receipt for your donations, getting other volunteers involved or having animals at your event. Go the extra mile by walking your dog! By downloading and using a special app called Walk for a Dog by WoofTrax, donations will be made to the shelter of your choice. Whether you walk your dog or one of our shelter dogs you can make a difference. For those that don’t have a dog you can select Cassie, a virtual walking companion who represents dogs in shelters everywhere. Walk a dog today and please, pick Nevada Humane Society as your benefactor! Thank you to all of the following corporate partners for generously supporting Nevada Humane Society’s lifesaving work! Making a memorial or honor gift to Nevada Humane Society is an excellent way to pay tribute to the special animals, people and events in your life. The added bonus is that your gift will help make the world a brighter place for homeless pets! As we know how difficult it is to lose a loved one, memorial gifts allow you to donate in memory of a person or pet. If you wish to make a memorial gift, please specify the name of the person or pet that has passed, as well as a contact and address for the family. This allows us to send an acknowledgement to the family to let them know that you made a donation in memory of their beloved one and that gift will provide care and help us find homes for homeless pets in Northern Nevada. Memorial gifts may be made online, in person, by check or over the phone as long as all above information is specified at the time of the donation. Honor gifts help you celebrate the special people and pets in your life. Many people do this for a holiday or birthday gift for fellow animal lovers. If you wish to make an honor gift, please specify the name of the person or pet that you are honoring, as well as an address for them. This allows us to send an acknowledgement to them to let them know that you made a donation in their honor (or their pet’s honor). Your gift will provide care and help us find homes for homeless pets in Northern Nevada. Honor gifts may be made online, in person, by check or over the phone as long as all above information is specified at the time of the donation. To donate over the phone, please call 775-856-2000 ext. 332. Your kind gifts to the Nevada Humane Society allow us to spend our funds on other, more immediate needs. We deeply appreciate your generosity! Generally, most new or gently used pet items are accepted, including things like toys, pet beds, carriers and kennels. Opened pet food or treats are accepted if they are not expired and we prefer them in the original packaging. Towels, blankets and sheets are other items we can use. Donations may be made during our regular adoption hours, which are Sunday through Friday, 11am to 6:30pm, and on Saturday, from 10am to 6:30pm at either our Reno or Carson City location. For non-pet related donation items, such as furniture, household goods and other human necessities, please know they are generally not accepted.Appliances and large electronics, including televisions, computers and more, are also not generally not accepted (though some modern technologies may be with prior arrangement). For specific questions, please contact 775-856-2000 ext. 332. To order items from Amazon, view our general wish list items or our kitten wish list items. Ship to 2825 Longley Lane, Suite B, Reno, NV 89502. Be sure to use AmazonSmile too, a simple and automatic way for you to support your favorite charitable organization every time you shop, at no cost to you. When you shop, you’ll find the exact same low prices, vast selection and convenient shopping experience as Amazon.com, with the added bonus that Amazon will donate a portion of the purchase price to your favorite charitable organization. 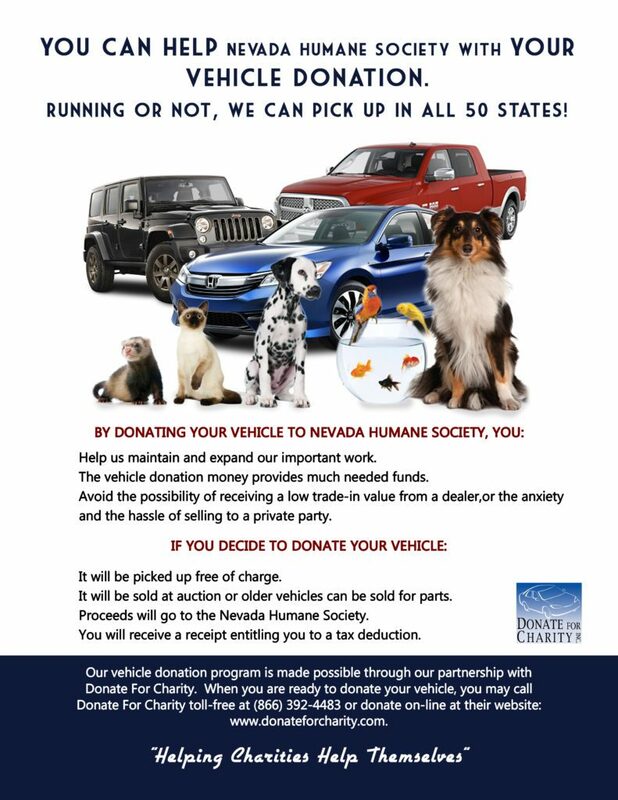 Just choose Nevada Humane Society as your charity of choice! If you are looking to donate a vehicle, please know we partner with Donate for Charity, Inc. to make this easy for everyone. Our expertise is not in selling cars, therefore we utilize professionals to help us gain the maximum amount of profit from your vehicle! Your vehicle can be picked up from almost any location in all 50 states and it does not have to be operational. To donate your vehicle, please call 866-392-4483 or complete the donation form online. The year, make, model and approximate mileage, as well as the VIN will need to be provided. For more specific vehicle questions, please click here. Estate planning means that you designate in your will or trust how your assets will pass to those about which you care. If you don’t leave a will or trust, state law determines how your assets will be divided. Many people think that wills are reserved for the wealthy, but anyone with a home or a family should have a will. What you put in your will is what people will remember you by. Your will gives you the opportunity to transfer the values that are important to you. One of the best ways to leave a legacy like this is to make charitable bequests in your will. NHS relies on donations and grants to continue our lifesaving work. We are a charitable, 501(c) 3, non-profit, no-kill animal welfare organization. You can help us sustain our programs and save even more animals by including Nevada Humane Society in your estate planning. Please call 775-856-2000 for more information. Should you need our Federal Tax ID, the number is 88-0072720 and our complete contact information is at the bottom of the page. The first thing you need to do when planning a will or trust is to get sound legal advice. When the time comes for your will to be probated, you won’t be here to correct any misunderstandings. To avoid trouble for your heirs, be sure to seek counsel of an attorney who specializes in probate and estate planning. Update your will or trust often. An old will can be almost as bad as none at all. Life events, tax law changes, a move to another state, or changes in the nature and value of your assets can also affect your will. To make sure your wishes are followed, keep your will or trust updated. Designating the funds can be done two ways: a fixed dollar amount or a percentage of the estate. Your gift can be contingent. That is, the funds would go to an individual if that person survives you. If not, they would be paid to NHS. You can create a trust which would pay an income to the individual for life, with the remaining principal to be given to NHS. A gift without restrictions is usually the most useful because it allows us to apply the funds to our most pressing needs. But you also have the right to restrict your gift by specifying in your will how the funds are to be used. Some people which to designate funds to help dogs or cats specifically or to a specific program. If you wish to do so, it would be best to consult us before you execute your will to make sure the conditions are ones we will be able to meet.